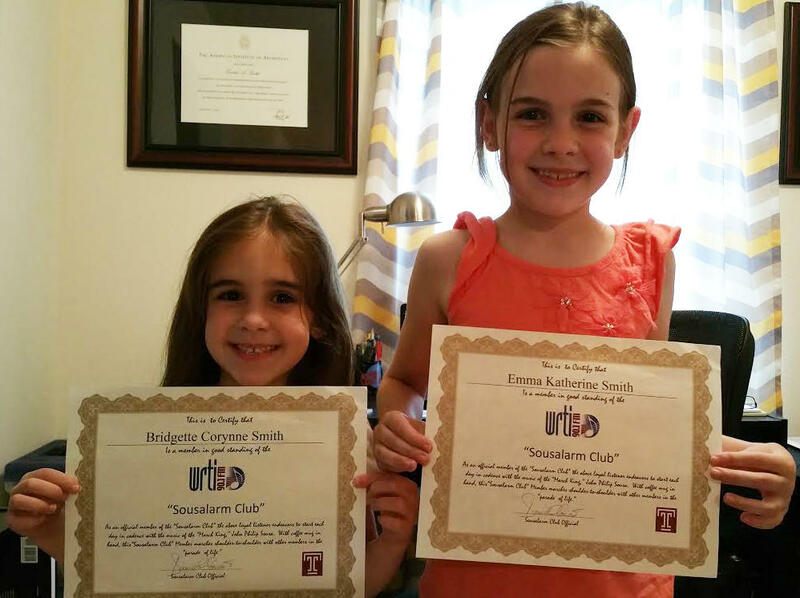 Bridget and Emma, from Monmouth Junction, NJ, are two very proud and excited members of the Sousalarm Club. 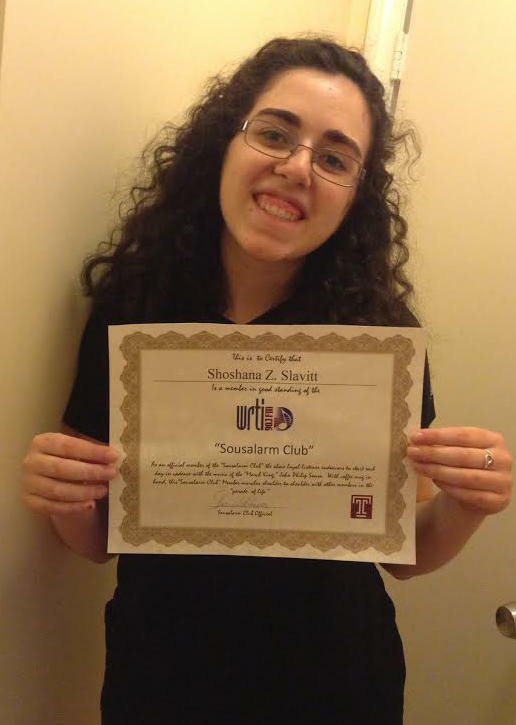 Sydney, from Merion Station, PA, loves listening to the Sousalarm and is to so happy to be a member of the club. 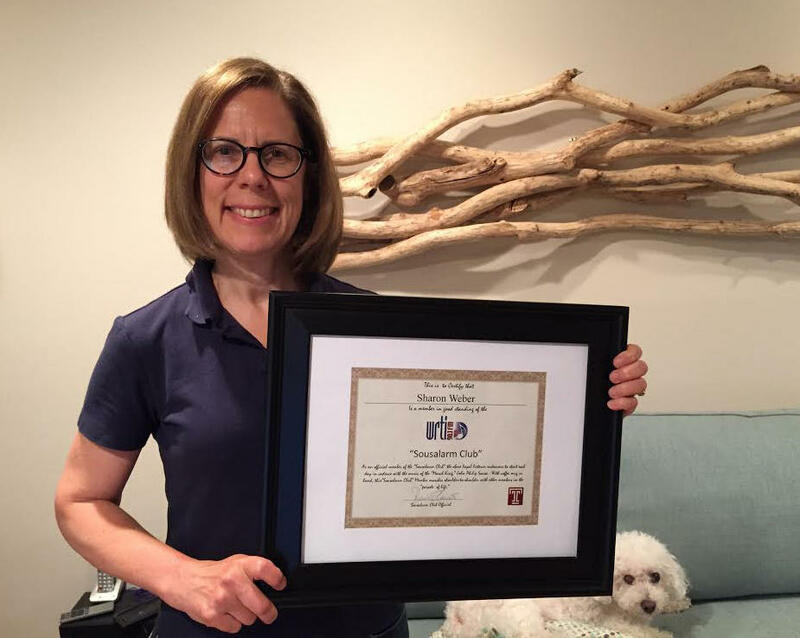 This is Sharon Weber from Coopersburg, PA. She has framed her Sousalarm membership certificate, which really shows her dedication to the club. 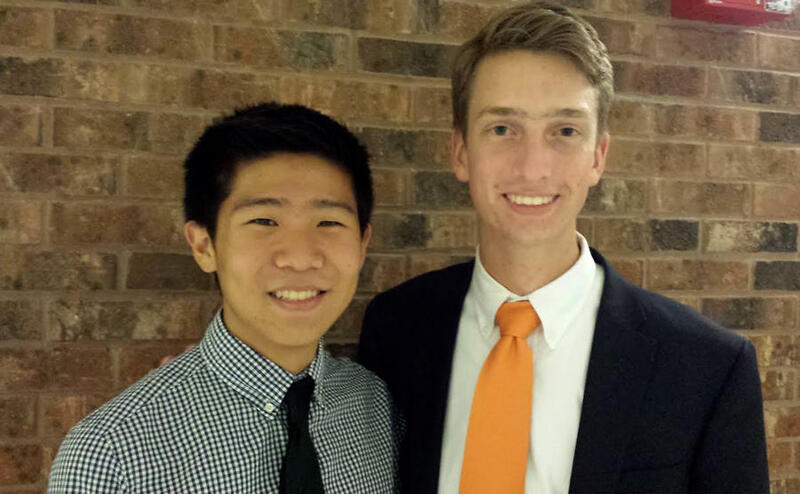 This is Jack (left) and Drew (right) from Ambler, PA. Drew has nominated Jack to become a member of the Sousalarm Club and he will be inducted very soon. 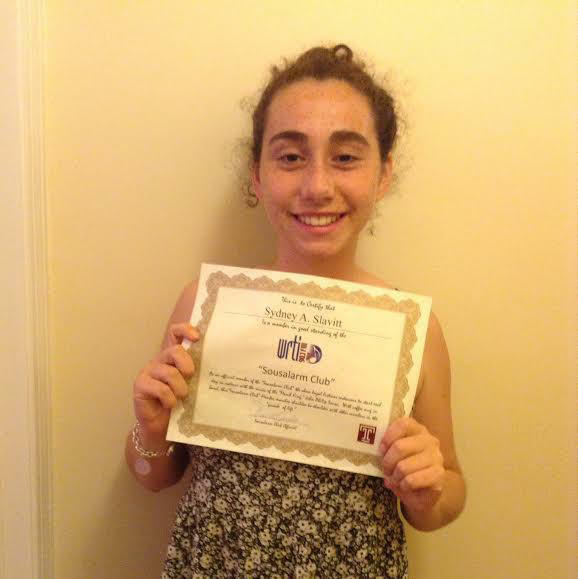 This is Shoshana, the author of this post, from Merion Station, PA. She is so proud to be a member that she had to write about it! 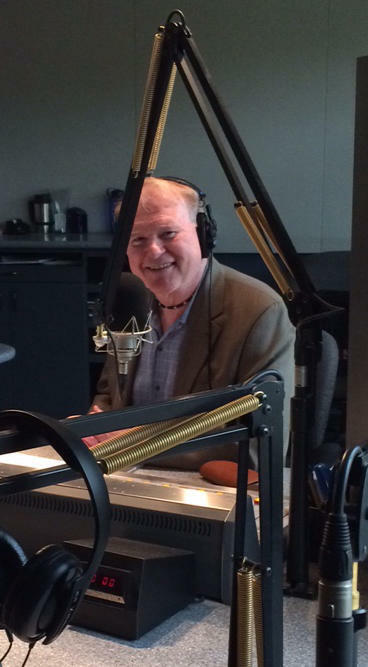 WRTI Classical Host Gregg Whiteside invites you to tune in to the Sousalarm at 90.1 FM in Philadelphia, every weekday morning at 7:15. Listen to Shoshana's radio story about the Sousalarm. A good march can really get the blood pumping, and what better time for that than 7:15 am? Now, WRTI intern Shoshana Slavitt takes a look at the 26-year history of the Sousalarm. Join the Sousalarm club today! Sign up here to request membership, and include your postal address, and any dedication or story about your experience listening. If you're an early bird and a lover of marching bands, then you should tune in to WRTI for the 7:15 am Sousalarm. What is the Sousalarm? The Sousalarm is the march, usually composed by John Philip Sousa, that helps listeners wake up in the morning on weekdays. Although members don't get free coffee anymore, that doesn't stop people from wanting to be a part of the Sousalarm Club. The Sousalarm began in 1989 by Dave Conant, who is now the general manager of WRTI and was also the classical morning host at WRTI and WFLN for many years. 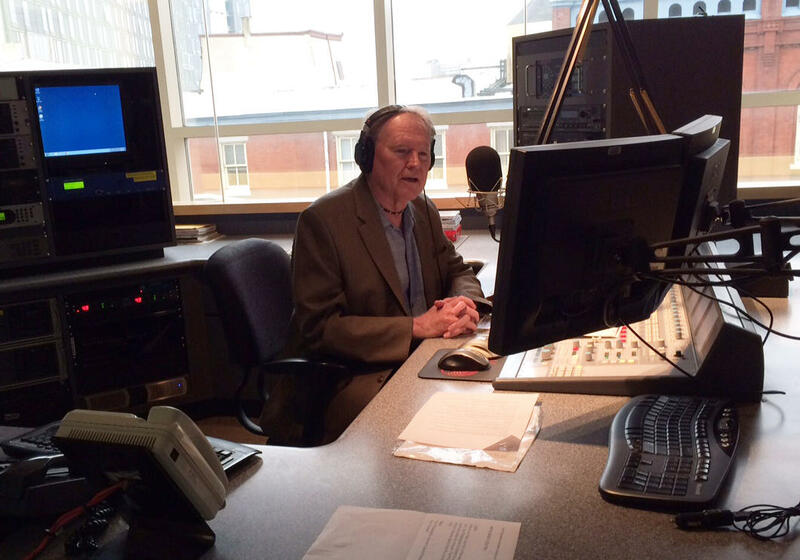 He started the Sousalarm when he was at WFLN, which was the classical radio station in the Philadelphia area at the time. When WRTI, previously Temple University’s jazz radio station, and WFLN merged and became the classical and jazz radio station in 1997, Conant brought the Sousalarm with him. Gregg Whiteside, the current classical morning and Sousalarm host, at the mic. Ever since the beginning of the Sousalarm there was a Sousalarm Club, where listeners could email the station and become a member of the club. When you become a member by signing up here, you get inducted into the club on the radio after the daily march. The host announces who the inductee is and says a little about them and then, a few days later, their Sousalarm Club certificate arrives in the mail. However, back in its WFLN days, members not only received a certificate to the Sousalarm Club, they would also get a certificate from Maxwell House Coffee for a free canister of coffee. The name Sousalarm is a play on the word snooze alarm. Although members don’t get free coffee anymore, that doesn’t stop people from wanting to be a part of the Sousalarm Club. Gregg Whiteside, who became the classical morning and Sousalarm host in 2012, receives so many emails a day that he is booked for two months ahead. There are more than 4,000 members already, but this constant flow of emails means that there will still be a lot more to come. Sometimes, people who send emails for a membership want there to be a special march on the day of their induction, so they request a march. The most common marches that are requested are John Philip Sousa’s Stars and Stripes Forever, Semper Fidelis, and The Washington Post March. From 1989 to now, listeners have heard the Sousalarm bright and early in the morning, and you can, too. 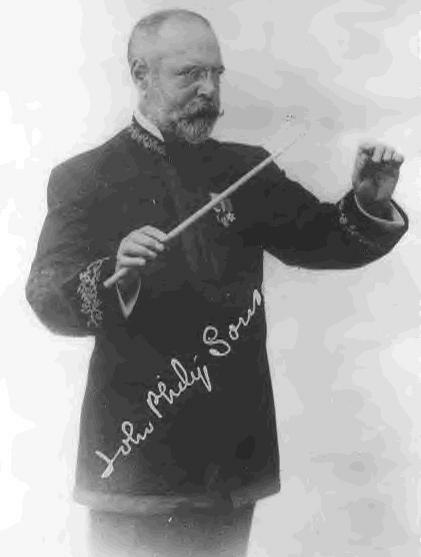 Even though there are other composers of marches, the Sousalarm is named after John Philip Sousa. The name Sousalarm is a play on the word snooze alarm, so Sousa’s name fit right in. It is also named after Sousa because he is the "March King." If you're a member of the Sousalarm Club, you know that the Sousalarm is at 7:15 am every weekday. For most listeners, that's a very practical time. It's become a check point for most people, either an alarm to wake up in the morning or a way to see if they are running late or on time to work or school. From 1989 to now, listeners have heard the Sousalarm bright and early in the morning, and you can, too. Join the Sousalarm club today! Send an email to Gregg@wrti.org requesting membership, include your postal address, and any dedication or story about your experience listening. This is the man himself, John Philip Sousa, ready to conduct a march at the drop of a hat. Sousa was born in Washington D.C. on November 6th, 1854. 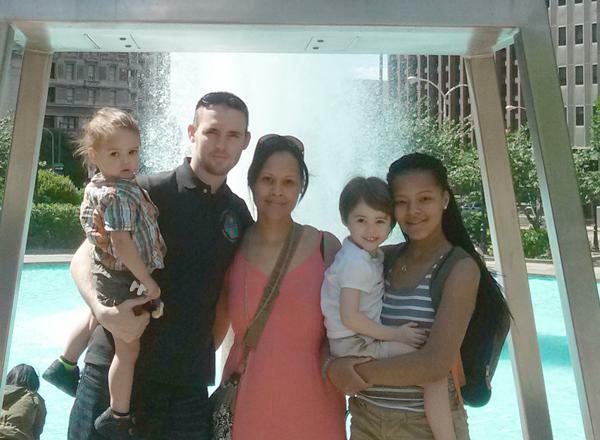 He grew up surrounded by military marches because his father played trombone for the United States Marine Band. Sousa's "The Liberty Bell" march can be heard on the television series MONTY PYTHON'S FLYING CIRCUS as their credits theme. At the young age of six he started the violin and, throughout his childhood, he studied voice, piano, flute, cornet, baritone horn, trombone, and alto horn. Sousa's father enlisted him to be an apprentice for the US Marine Band in 1868, when he was 13 years old. After seven years, Sousa left the Marine Band to pursue conducting. He then rejoined the US Marine Band in 1880 and became their conductor. He began building his reputation as a great bandmaster through his leadership of the Marine Band, which he made the premier band in the United States. 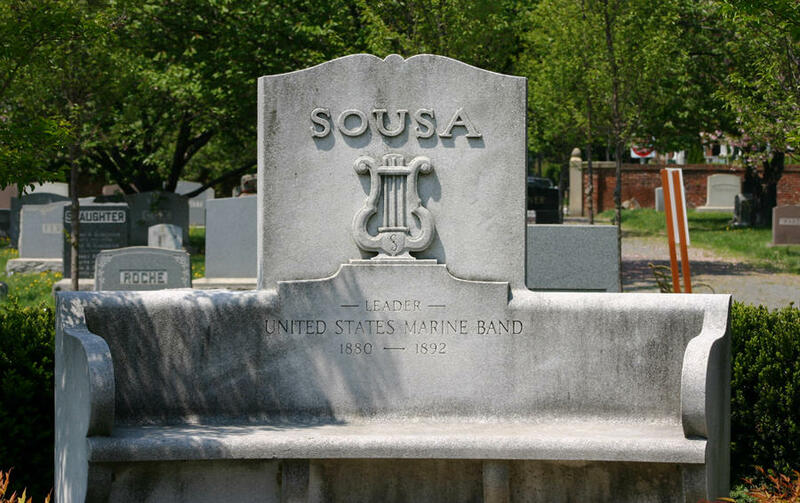 In 1892 Sousa left the US Marine Band again, but this time to create his own band called the Sousa Band. The Sousa Band toured around the United States and, eventually, they toured internationally. He toured with his band for 40 years, with a break from May 31st of 1917 to November 1918, when Sousa was commissioned as a lieutenant commander for the United States Naval Reserve, right after the United States joined WWI. John Philip Sousa wrote 136 marches, some of them well known and quite important. Semper Fidelis, which he wrote in 1888, is traditionally known as the "official march of the Marine Corps." Sousa's The Liberty Bell can be heard on the television series Monty Python's Flying Circus as their credits theme. 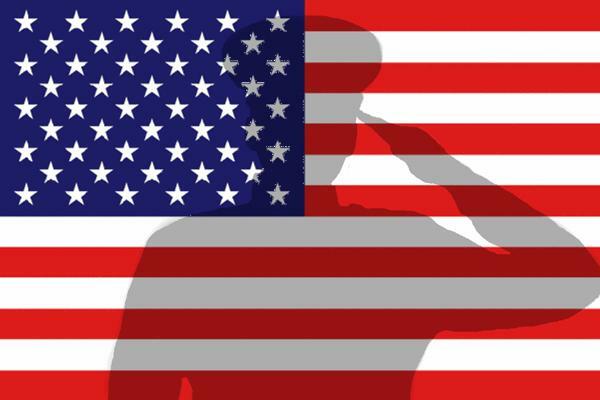 The Stars and Stripes Forever was named, by Congress, as the National March of the United States in 1987. Sousa focused solely on conducting and writing marches from 1880 to his death. He died on March 6th, 1932 from heart failure at the age of 77. Even though his heart failed, his marches keep our hearts beating. This is a picture of John Philip Sousa's gravestone in Washington, DC. The dates on it (1880-1892) are not the years of his birth and death, but the years he was the conductor of the US Marine Band. This morning I was greatly moved by an email from a listener - a veteran who felt compelled to share this story with me. I'm sure you'll enjoy it as much as I did. Last Wednesday, I read a moving letter on the air from Francesca Martinez when I inducted her family into the Sousalarm Club. So many of you responded to her heartfelt message, and asked if you could read it online, that we have posted it here (see below), with Ms. Martinez's consent. It's a poignant reminder of how transcendent the power of music can be, and of why this work, this station, and this art form matter so much. Gregg describes his awe-filled experience visiting the house where Schubert was born in Vienna. This story was originally published in 2013. 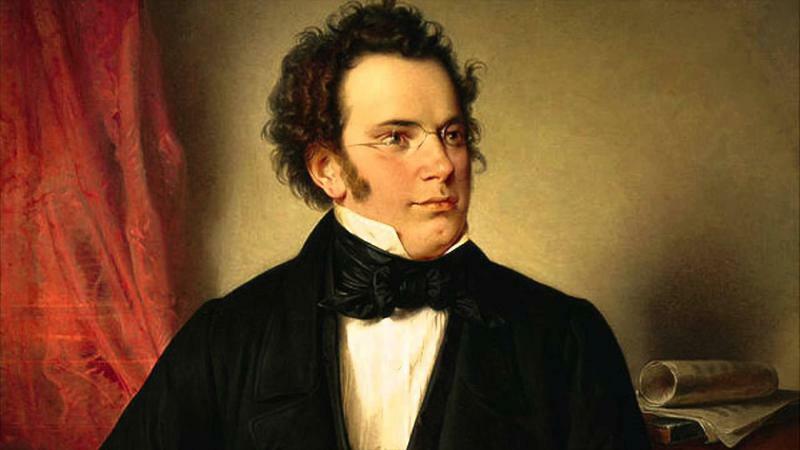 It's so easy to find oneself attracted to the music of Franz Schubert. His unmatched gift for lyricism makes him so approachable, so comprehensible; and we feel ourselves being pulled into his musical world—in my case, at a very early age.